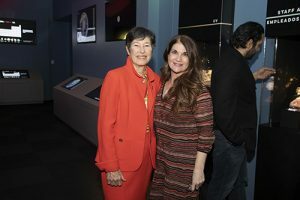 DALLAS — The Perot Museum of Nature and Science reopened Jan. 31, 2019 with a revamped Lyda Hill Gems and Minerals Hall — including four new signature displays and a new initiative — the Gems and Minerals Center of Excellence. Enhancements to the Lyda Hill Gems and Minerals Hall include a redesigned floor plan and new opportunities to educate and engage guests while highlighting one-of-a-kind signature displays and beautiful new pieces. 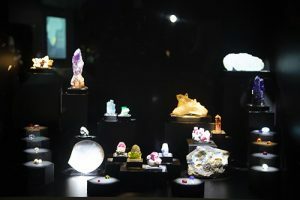 Known for extremely rare and significant specimens, the Museum uses a pioneering “loan-versus-own” collection method to display and regularly rotate some of the world’s highest-quality gems and minerals, allowing citizens of North Texas to explore Earth’s art and be inspired to learn more. 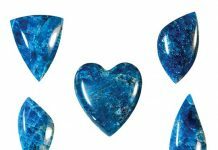 New birthstone exhibit in the Lyda Hill Gems and Minerals Hall. With information presented in English and Spanish, the refreshed Gems and Minerals Hall features a total of 37 cases, including four new signature displays with large, easy-to-use touchscreens. One signature case highlights birthstones (including the months with more than one) in both rough form (in its natural state from the ground) and faceted form (cut for artistry purposes). An additional display showcases exquisite jewelry created from the birthstones for each month, which will rotate 12 times per year. The Eyes of Africa, a show-stopping “alien eye” fluorite from Namibia on loan from Lyda Hill, appears in a larger case with updated details about its backstory. 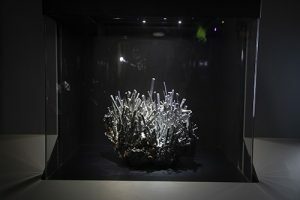 A third case displays an example of stibnite with robust clusters of crystal formations recovered from an industrial mine in the Jiangxi Province of China. Rounding out the premier cases is the beloved “grape jelly” interactive geode – a 5-foot-tall amethyst geode. Another stand-out piece in the gallery is the luminescent “Aurora Butterfly of Peace” on loan from owner and curator Alan Bronstein. The work of art is comprised of 240 colored diamonds (some that fluoresce) in the shape of a butterfly that Bronstein says symbolizes a “spiritual connection to Earth for all humankind.” With colors ranging from fiery orange to tranquil blue and rosy pink, the “Aurora Butterfly” took 12 years to create and is adorned with diamonds from nearly every continent on Earth. On display through spring, the “Aurora Butterfly” is surrounded by a rainbow of mineral cases each dedicated to a different color. A sampling of specimens with a southwestern flair is also displayed from Texas, Colorado, Arizona and California along with those from different countries, including China, Mexico, Brazil, Germany, Australia and Afghanistan. Another part of the gallery spotlights an array of minerals, including tourmaline, rhodochrosite, aquamarine, garnet, opal, fluorite, calcite, smithsonite, pyrite and quartz. There’s also a case displaying pieces on loan from Perot Museum staff and volunteers, demonstrating that anyone and everyone can participate in this captivating science in a variety of ways. 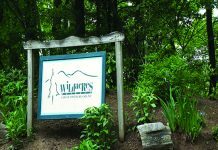 Spearheading the second strategic initiative is Kimberly Vagner, who recently joined the Museum as director of the Gems and Minerals Center of Excellence. 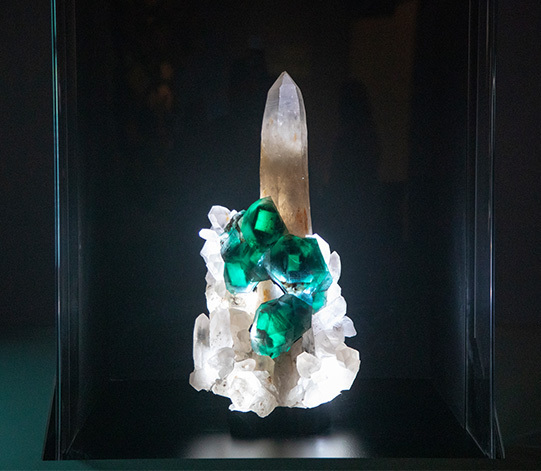 Bringing a vast amount of expertise to the position, Vagner is charged with curating the collection, guiding the “loan-versus-own” method of displaying, creating ways to increase interest in gems and minerals, and developing educational programs for visitors of all ages. The Museum also has established the Perot Museum Gems and Minerals Legacy Award to recognize support for the Museum’s Gems and Minerals Center of Excellence and outstanding contributions to the gems and minerals community. Lyda Hill is the 2019 recipient of the newly named award in tribute to her longstanding stewardship of the Museum and generosity in sharing her personal treasures with the community. 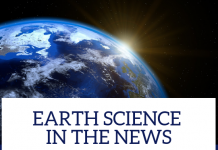 The Perot Museum of Nature and Science opened in late 2012 and has since welcomed more than 5.5 million people and awarded $2 million in school financial aid. The Museum is located at 2201 N Field St. in Dallas, TX. 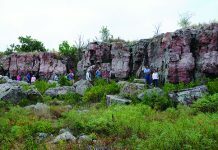 For more information, visit www.perotmuseum.org, email info@perotmuseum.org or call 214-428-5555. Stibnite mineral; one of four new signature specimens in the Lyda Hill Gems and Minerals Hall.